Portable hot water heaters buying tips. Review of the popular models; Camp Chef, Zodi, Eccotemp, Camplux, and Coleman designed for hot water production and use in outdoors when traveling or in the backyard, and for dishes, short shower, animal or car wash.
Portable hot water heaters are built small, compact and lightweight that can be easily carried and installed, making them an ideal solution for heating the water, when away from home - when camping, hiking, boating, fishing, hunting, surfing, boating and RVing or at home by the pool. 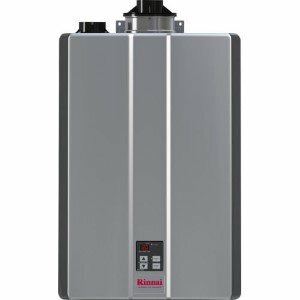 Portable water heaters are designed as tankless or tank-type, where the tankless units heat water on-demand and deliver it in an endless supply, while the tank-type units store the water inside the tank and have the limited capacity. By simply attaching the garden hose your new tankless and portable water heaters will provide all the hot water you need. As they don’t have to be hooked on the electric grid, and since they use batteries for ignition, you are not restricted where to install it. You just need a propane tank, or two. If you need hot water for the camp shower, cooking, morning coffee or dishes, buy a portable water heater using the provided users’ guide, buying tips and top-selling model reviews below. 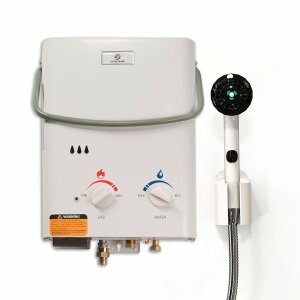 There is a variety of small, tankless and tank-type portable water heaters using the propane gas, available online such as Amazon.com or in stores like Home Depot, Lowes, Wallmart, Campingworld, and Canadian Tire. As they operate using the propane gas, keep in mind that none of the portable water heaters come with the propane tank – it has to be purchased separately and very often it is the same tank as used for the barbecues. Camp Chef HWD5 Triton is the portable water heater that uses the tankless design to deliver up to 1.5 GPM of hot water - on demand, as long as there is gas in the propane tank and the minimum water flow of 0.5 GPH is met. Using the Camp Chef Triton is simple, it ignites with the water flow and includes features to adjust the heat and water flow. The unit is made of steel for durability, but due to its small size of 12”x4”x15” and weight of only 14.6 pounds it can be installed anywhere, hanging on the tree, fence, post, on the truck cargo bed, and wherever it is convenient. The gas burner, which is able to deliver up to 34,000 BTU is powered by propane and from the propane tank (capacity of 20 pounds). Hot water is delivered in continuous supply, and according to the manufacturer, the runtime is approximately 11 hrs. with one charge, but it depends on the set temperature. 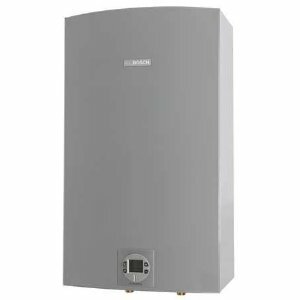 If looking to buy a portable hot water heater from an expert of the outdoor equipment, Coleman brand is what you should look for. The Coleman Company has been making products for recreational and outdoor use, like camping and hiking, for many years. 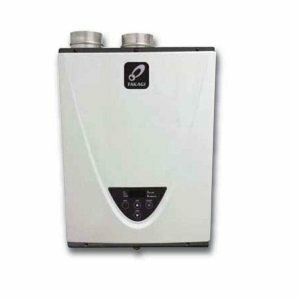 For the convenient hot water use, the Coleman Company offers one propane tankless water heater which is the top seller on Amazon.com, with many positive reviews – H20asis model. Installation is simple, just connect the pump to the 5-gal water carrier. Set the temperature on the thermostat and in less than a minute, hot water with a maximum temperature of 125 F is ready. The unit comes with the built-in rechargeable lithium-ion battery, that can be recharged when plugged into the 12 V car outlet. On a single battery charge and when using one 16.4-ounce propane cylinder, Coleman can heat up to 40 gallons and the run time is approximately 80 mins. The battery is used to power the electric pump and LED display where you can find useful info such as the battery status indicator, so you will know when the unit has to be charged again. The unit provides steady performance no matter the weather condition, thanks to the PerfectFlow technology and convenience with the Instastart ignition system, which allows automatic ignition. It comes with the shower head and 6-ft silicone hose making the heater ready to use right from the box. With the approximate size of 16.7”x10”x21” and weight of 18 lbs., Coleman H20asis model is slightly bigger/heavier than the above Camp Chef Triton, but is still easy to handle. The gas burner is able to provide up to 19,500 BTU which is much lower than the Triton model from above text. Due to heavy duty construction and elements, Coleman is able to provide the warranty of 3 years. The EccoTemp L5 portable hot water heater is very simple to install, and one of the reasons is the small and lightweight design; so just hang it on the tree or your RV, plug it and open the tap – it automatically ignites with the water flow, making hot water ready in seconds. Another element that makes the Eccotemp portable is that it can work in off-grid areas, simply by using provided two “D” cell batteries, used for the ignition. The gas burner is big as the burner from Camp Chef Triton - 35,000 BTU, heating water from 80 F to 150 F while providing the flow rate of 1-1.5 GPM. With the size of 16.5”x5.5”x11.5” and a weight of 8 pounds, EccoTemp L5 is much smaller and lighter than Triton. With the provided gas regulator and by attaching it to the standard 20-pound BBQ propane tank, it can run up to 18 hours. It is also equipped with the shower hose with ON/OFF nozzle and multiple spray pattern and standard 1/2" NPT pipe fitting and the garden hose adapter. Zodi is the company that specializes in the outback gear, including portable propane water heaters. These are also called instant hot-showers as they are able to produce hot water almost instantly with the temperature up to 100 F.
Zodi portable hot water heaters are designed specifically for camping, RVs, hiking, boating, and other outdoor activities. From the Zodi program, I will mention two popular and easy to use portable propane water heaters; Single Burner Hot Tap and High-Performance Double Burner Heaters, with two propane tanks. Single burner hot tap is excellent for campers as there is an option to buy a hot shower with the soft case, which expands to 4-gallon storage, making it ideal for the transport. Zodi portable water heaters are designed with premium quality, for extra durability. By placing the pump in the water, Zodi portable heaters are very easy to use. No assembly required. High performance starts with the simple push ignition button. Compact design fits in the rugged waterproof case. Easy to carry. The above Zodi portable water heaters can heat up to 60 gallons, with battery and propane refills. Powerful pump that delivers great pressure with the installed debris filter for protection against dirty water. Water-tight battery case with 48" power cable and holds 4 D-cells. Altitude rated regulated valve, installed on the propane tank, with the ignition push button and heat control. Metal housing that carries the propane tank is built tough and durable. Long shower hose and wide spray shower head. Plastic storage case that protects the shower and holds 4 gallons of water. Zodi manufacturer is the only one among the above three that offers different types of portable heaters, which are specifically designed for camping and other outdoor activities. The Camplux AY132 is one of the cheapest of top 5 selected here and is the best-selling product for portable water heating on Amazon.com. While the above models are designed for the outdoor use only, the Camplux, thanks to the Oxygen Depletion Sensor can also be installed indoors as long as there is proper ventilation. It is equipped with all the necessary parts for easy installation, but it requires two lithium-ion batteries for the automatic ignition. The gas burner of 34,000 BTU can heat water to the maximum temperature of 115 F and provide 1.32 GPM. Even with an easy connection to the propane gas tank, the unit is pretty safe to use. It is equipped with the 20-min automatic safety device, oxygen depletion safety shutoff protection, anti-freeze system, and flame failure device. Having hot water at home is a necessity today, but what happens if we are away, in the outdoors for example. This is why we have included portable water heaters, so you get hot water anytime and anywhere. Those top 5 models reviewed here are perfect when camping, traveling, RV-ING, cottages, and cabins, even at the farm and backyard. No matter IF you need hot water for dishes, shower, to make a lunch or hot beverage, even to clean a pet, car or anything else, you are covered. Keep in mind that they all work perfectly in warm regions, but not in winter. They have to be correctly drained and winterized; otherwise due to the delicate design can freeze and break.